It was first mentioned in a Greek deed of gift by King Saint Stephen in 990 (in 1025). This document mentions the ancestor of the village called Máma, which was situated in the territory of the present settlement. It was destroyed in the Middle Ages, as well as in the 17th century. The relics of the settlement demonstrate that its natural endowments made people settle down and stay here. The railway line was built in 1908 and that was the start of a new period in the life of the settlement. The Roman Catholic church was built in 1936-37. 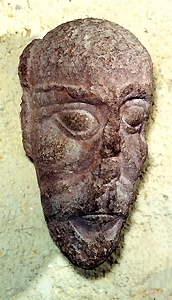 To celebrate the millennium, the sculpture called "Fűz-fő" was made by sculptor Bernadett Szilágyi from Fűzfő. It can be seen in the millennium park. 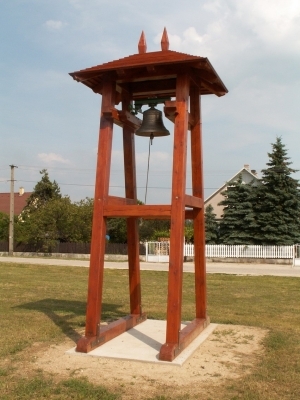 The series of programmes called the Days of Fűzfő is held in the week of Saint Stephen's Day. Take the tourist route starting at the railway station and visit the Rom-kút valley and the remains of a Roman villa. From the town you can take the bicycle road towards Balatonkenese and Balatonalmádi. On the top of the Máma you can enjoy the circular panorama of the eastern basin of Lake Balaton. 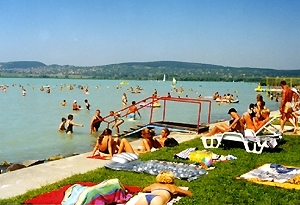 Balatonfűzfő is proud of its smooth-sand bath called Föveny, where you can enjoy the newly built kamikaze and pleasure chutes. The bath in the part of the town called Tobuk has ben rebuilt, too. In Irinyi street you can find a playground which meets the European Union standards. Sport has always played an important role in the modern history of the settlement. The first bob-sleigh run of Lake Balaton was opened in Balatonfűzfő. At present Fűzfő serves as an important tourist and sports centre of county Veszprém with its lake shore, famous swimming pool, outdoor sports facilities, Olympic champion shooters and sailing.